Like many towns in southern Italy, Naples is rich with historically significant landmarks. In fact, when they started digging for a new subway line several years ago, an entire Roman port was discovered. An extraordinary, and lesser known, example of Roman architecture is the archeological and natural reserve of the Pausilypon. The site was built by the Roman knight Publio Vedio Pollio in the 1st century BC. Upon his death, he bequeathed the property to future emperor Augusts, making the property an official imperial estate. As such, the property was enlarged and modified over the years. One of the most interesting aspects of the site is the 770 meter long tunnel that was dug out into the hillside of Posillipo. The tunnel was constructed in order to connect the complex to the main road and thus easy access to Rome. Connected to the Underwater Park of Gaiola, the Pausilypon site is intriguing from an archeological, environmental, and historical perspective. And if that’s not enough of a reason to visit, there is a series of summer concerts held on site! 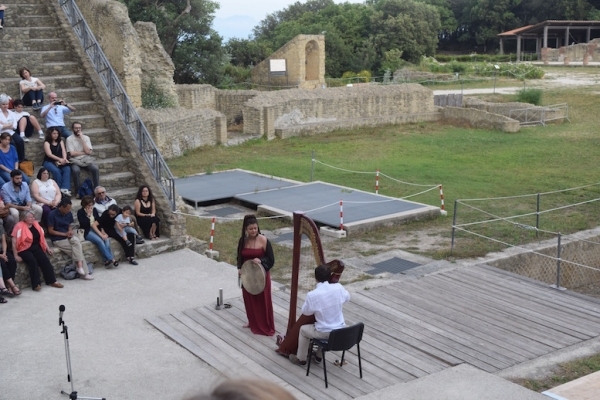 Throughout the months of May and June, there is a series of sunset concerts held at the archeological site. Curated by the Centro Studi Interdisciplinari Gaiola Onlus, the concert series features a variety of artists and ensembles. Last week, we were lucky enough to catch a harp and soloist performance at the park. From walking through the underground tunnel to enjoying live music with views of the Mediterranean, it was an experience not to be forgotten. For those visiting southern Italy outside the months of May and June, tours of the archaeological site are available all year. Guided as well as self escorted tours are available- contact the Italian Concierge for more details!